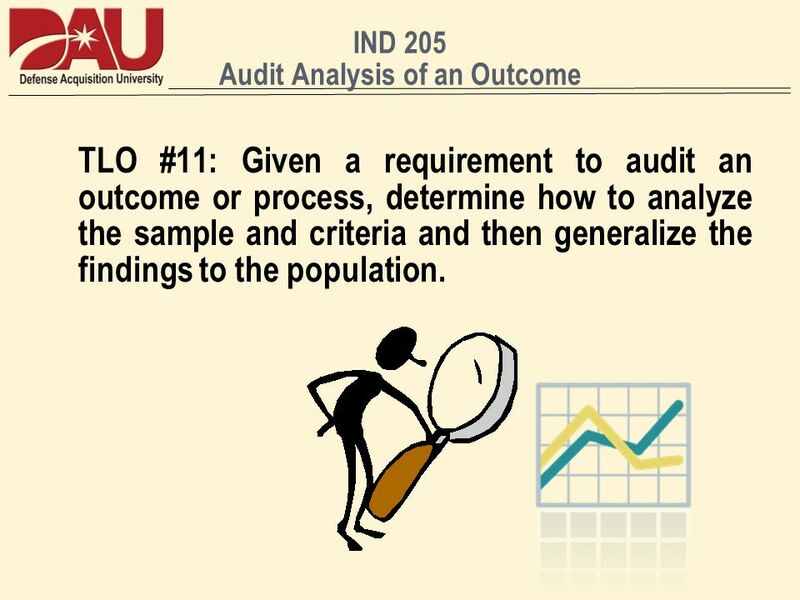 TLO #11: Given a requirement to audit an outcome or process, determine how to analyze the sample and criteria and then generalize the findings to the population. *Reports *Utilizing Government Property *Maintenance *Property Closeout 7. Distinguish between a systemic and non-systemic defect(s). 8. Distinguish between a material and immaterial defect(s). 9. 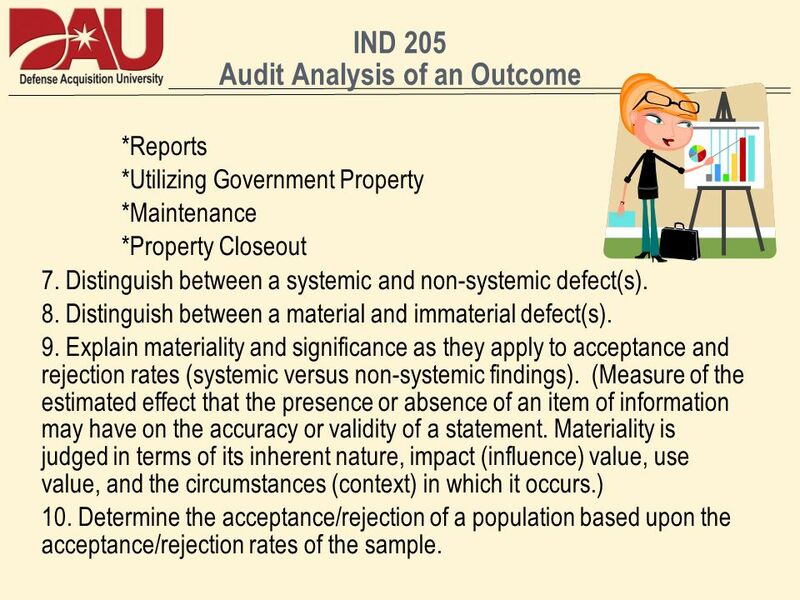 Explain materiality and significance as they apply to acceptance and rejection rates (systemic versus non-systemic findings). (Measure of the estimated effect that the presence or absence of an item of information may have on the accuracy or validity of a statement. Materiality is judged in terms of its inherent nature, impact (influence) value, use value, and the circumstances (context) in which it occurs.) 10. Determine the acceptance/rejection of a population based upon the acceptance/rejection rates of the sample. 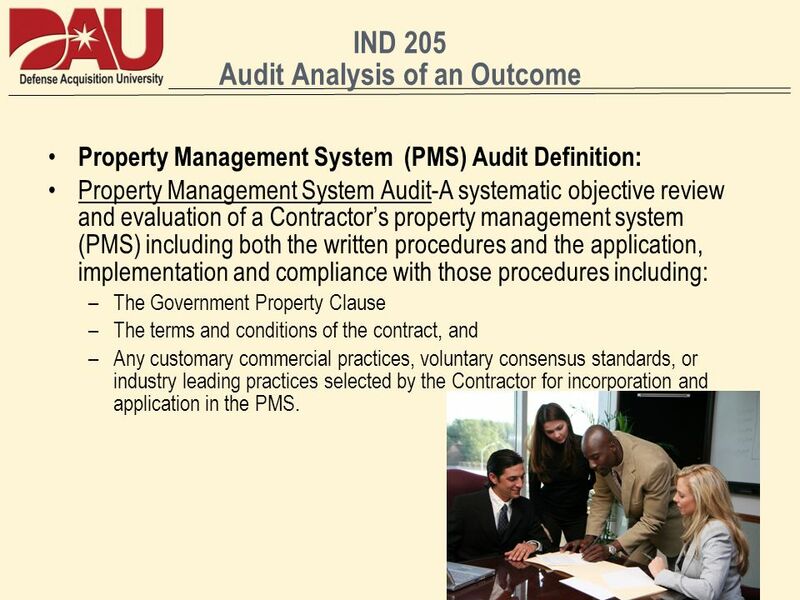 Property Management System (PMS) Audit Definition: Property Management System Audit-A systematic objective review and evaluation of a Contractor’s property management system (PMS) including both the written procedures and the application, implementation and compliance with those procedures including: The Government Property Clause The terms and conditions of the contract, and Any customary commercial practices, voluntary consensus standards, or industry leading practices selected by the Contractor for incorporation and application in the PMS. 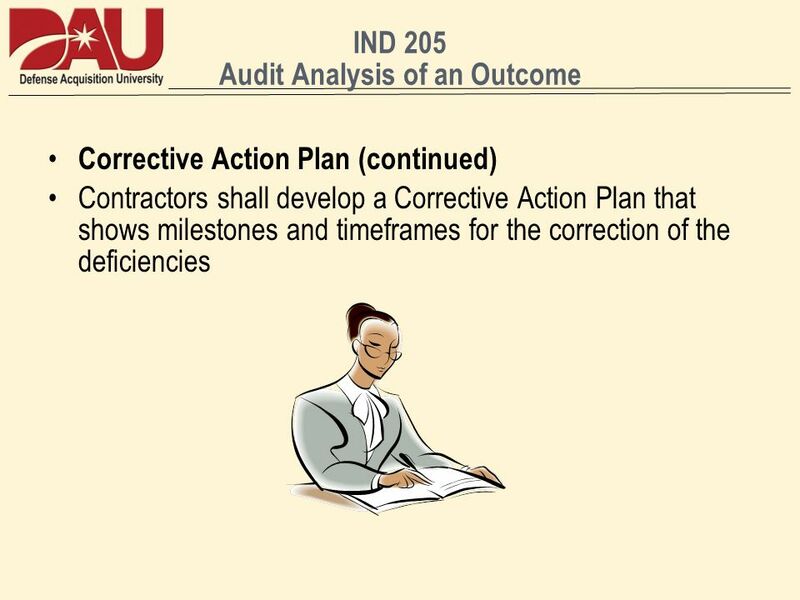 The written procedures serve as a “standard” or a way to measure the performance of the Contractor’s processes, systems, records, and methodologies. Contractor employees are expected work to this standard (application of the procedures). 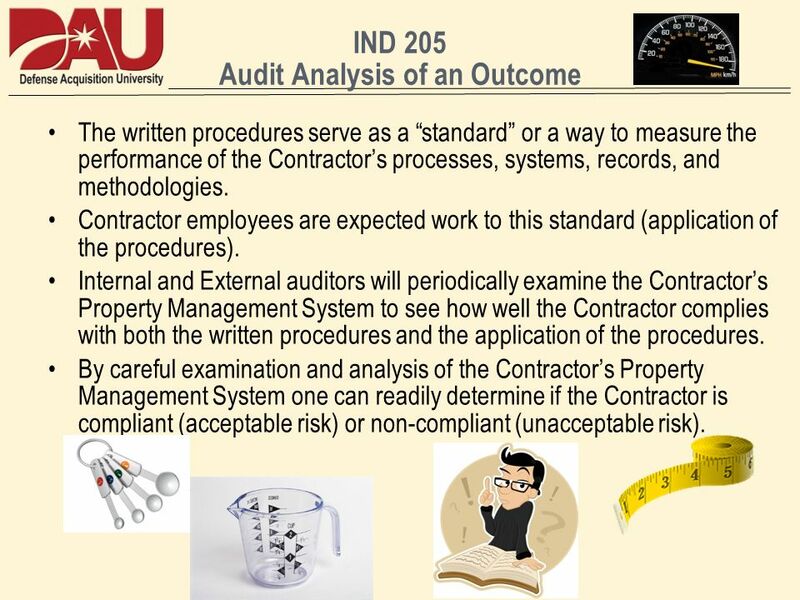 Internal and External auditors will periodically examine the Contractor’s Property Management System to see how well the Contractor complies with both the written procedures and the application of the procedures. By careful examination and analysis of the Contractor’s Property Management System one can readily determine if the Contractor is compliant (acceptable risk) or non-compliant (unacceptable risk). 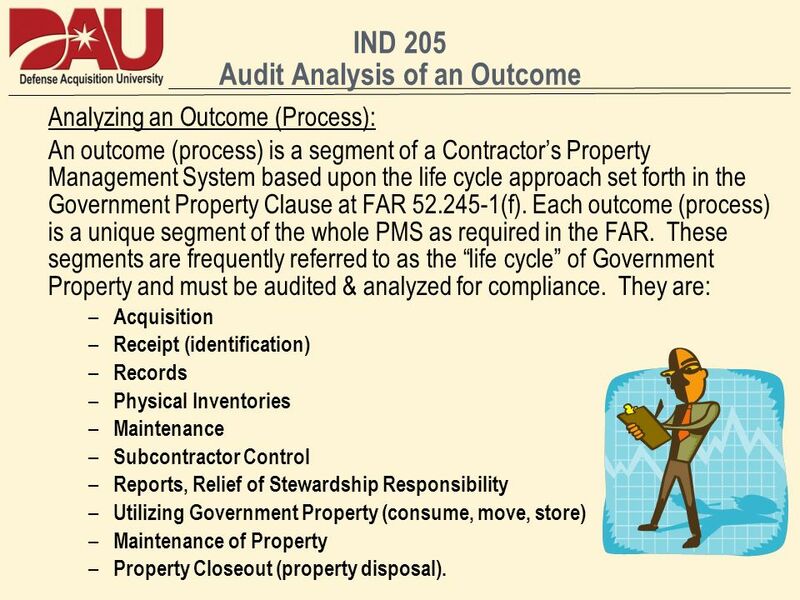 Analyzing an Outcome (Process): An outcome (process) is a segment of a Contractor’s Property Management System based upon the life cycle approach set forth in the Government Property Clause at FAR (f). Each outcome (process) is a unique segment of the whole PMS as required in the FAR. These segments are frequently referred to as the “life cycle” of Government Property and must be audited & analyzed for compliance. They are: Acquisition Receipt (identification) Records Physical Inventories Maintenance Subcontractor Control Reports, Relief of Stewardship Responsibility Utilizing Government Property (consume, move, store) Maintenance of Property Property Closeout (property disposal). Minimum requirements for a Property Management System: FAR establishes the MINIMUM requirements (standards) for each Outcome (Process). 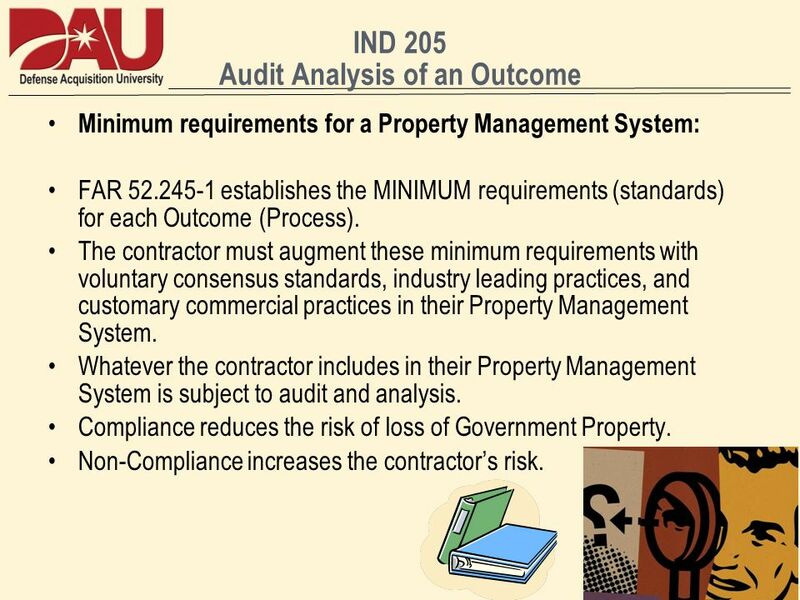 The contractor must augment these minimum requirements with voluntary consensus standards, industry leading practices, and customary commercial practices in their Property Management System. 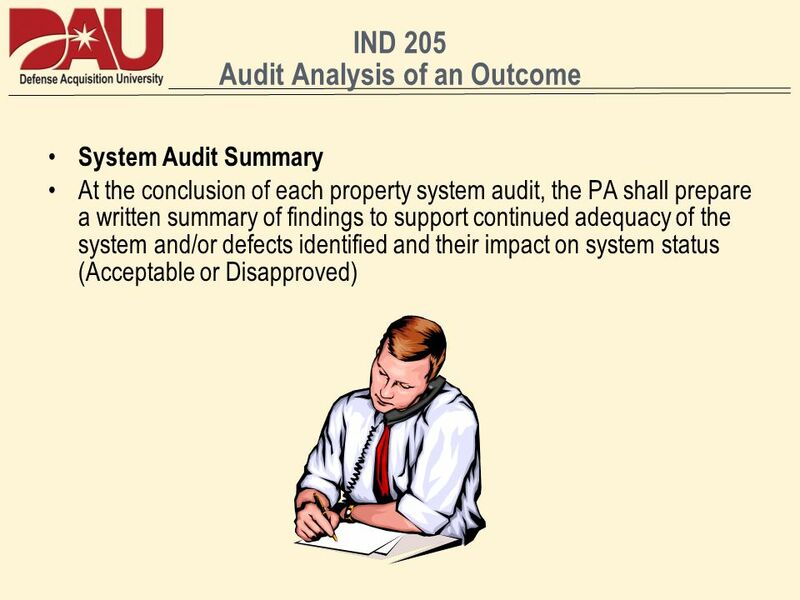 Whatever the contractor includes in their Property Management System is subject to audit and analysis. Compliance reduces the risk of loss of Government Property. Non-Compliance increases the contractor’s risk. Population-An aggregation of documents or records, or even physical assets, or possibly even actions selected for review due to their “common characteristics.” Sample-A number of items such as documents, records, articles, or actions selected from a population/lot for a review in order to draw inferences regarding and generalizable to the status of the population. 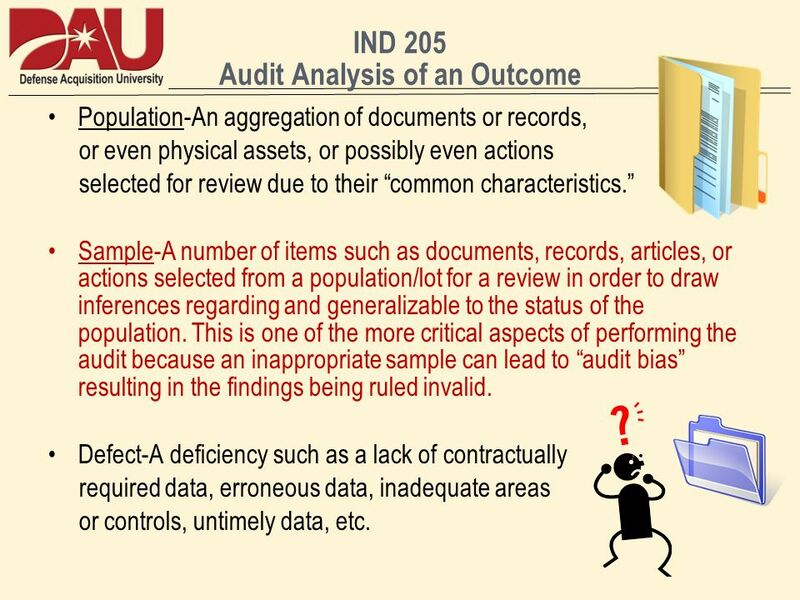 This is one of the more critical aspects of performing the audit because an inappropriate sample can lead to “audit bias” resulting in the findings being ruled invalid. Defect-A deficiency such as a lack of contractually required data, erroneous data, inadequate areas or controls, untimely data, etc. 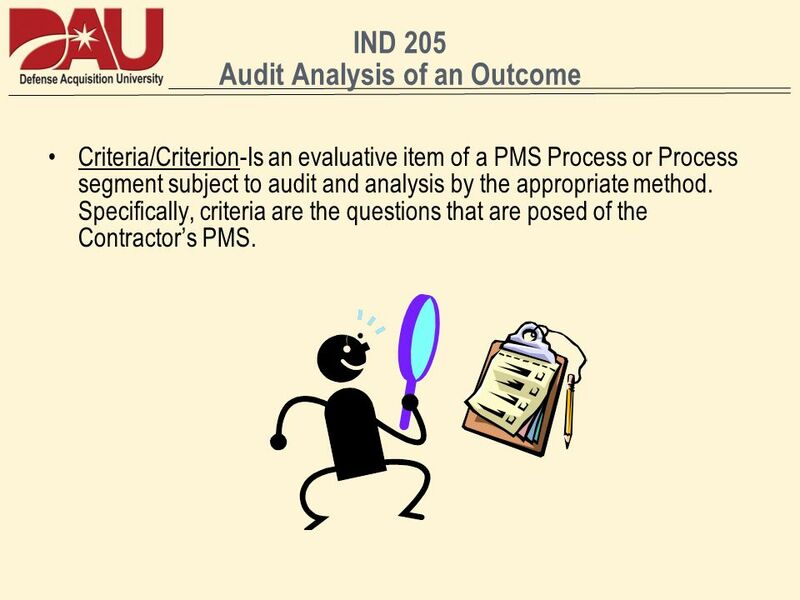 Criteria/Criterion-Is an evaluative item of a PMS Process or Process segment subject to audit and analysis by the appropriate method. Specifically, criteria are the questions that are posed of the Contractor’s PMS. 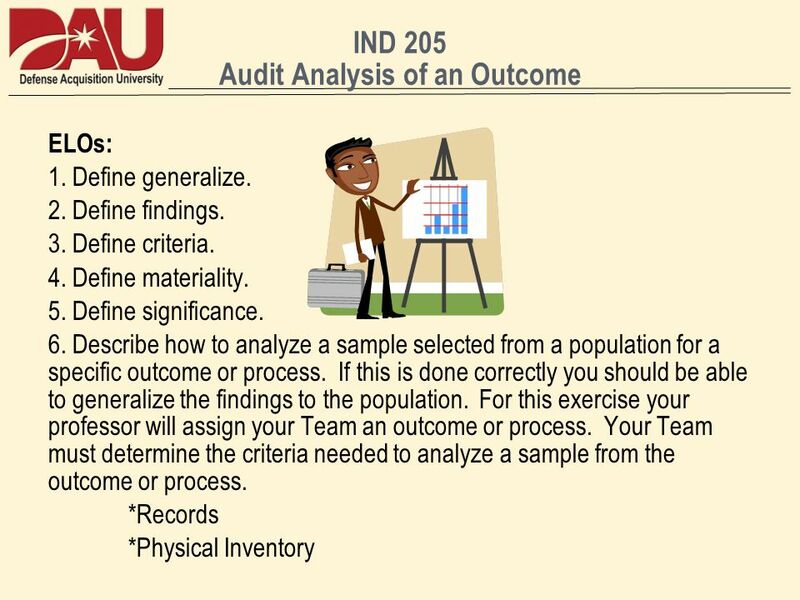 Criteria/Criterion: Many of these questions involve more complex answers than a simple “yes” or “no.” They require an analysis of the data embedded in the question. For example, “Property control records conform to the FAR…” this question requires an analysis of the record card (or electronic records) to assure that the basic information required by the FAR is provided on that record. See FAR (f)(iii) plus any additional information required by customary commercial practices, voluntary consensus standards, or industry leading practices. 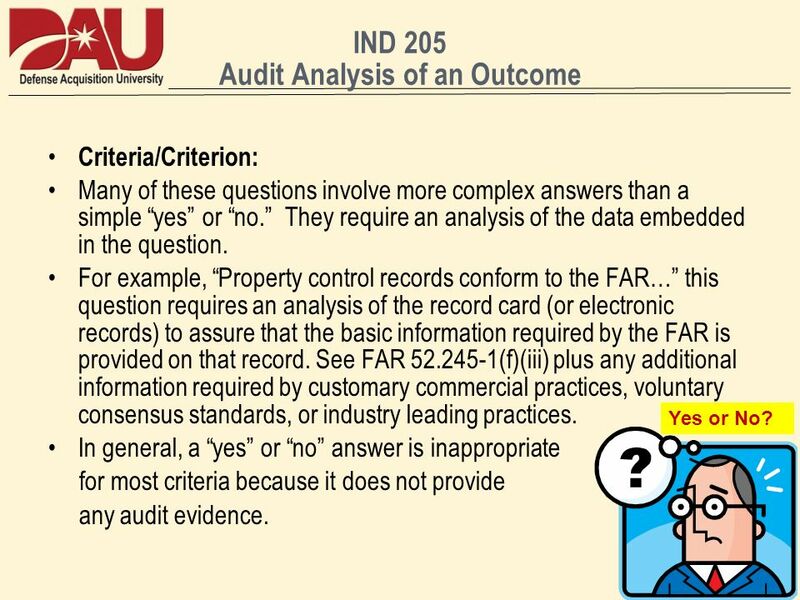 In general, a “yes” or “no” answer is inappropriate for most criteria because it does not provide any audit evidence. Yes or No? 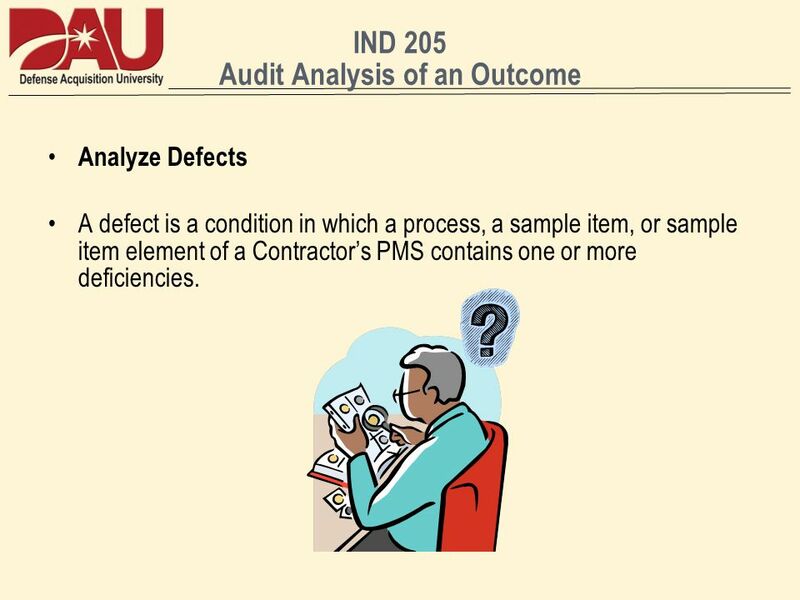 Analyze Defects A defect is a condition in which a process, a sample item, or sample item element of a Contractor’s PMS contains one or more deficiencies. 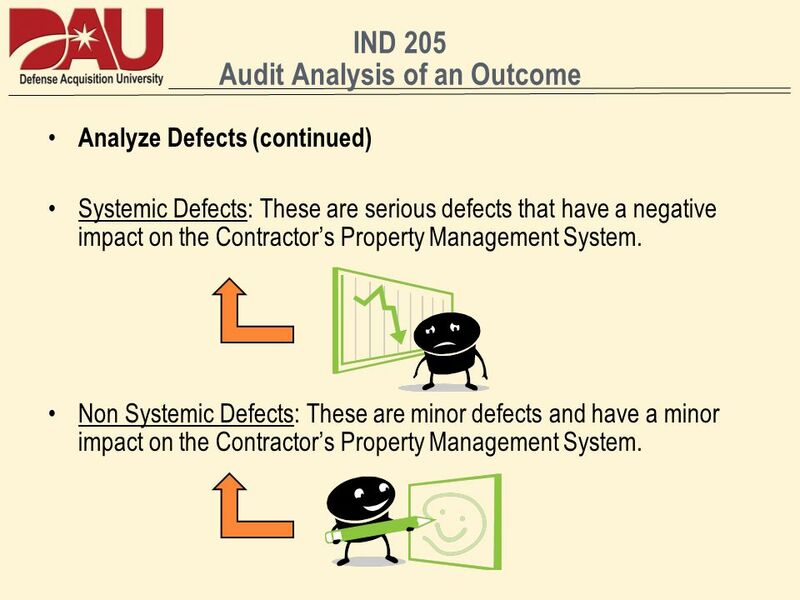 Analyze Defects (continued) Systemic Defects: These are serious defects that have a negative impact on the Contractor’s Property Management System. Non Systemic Defects: These are minor defects and have a minor impact on the Contractor’s Property Management System. 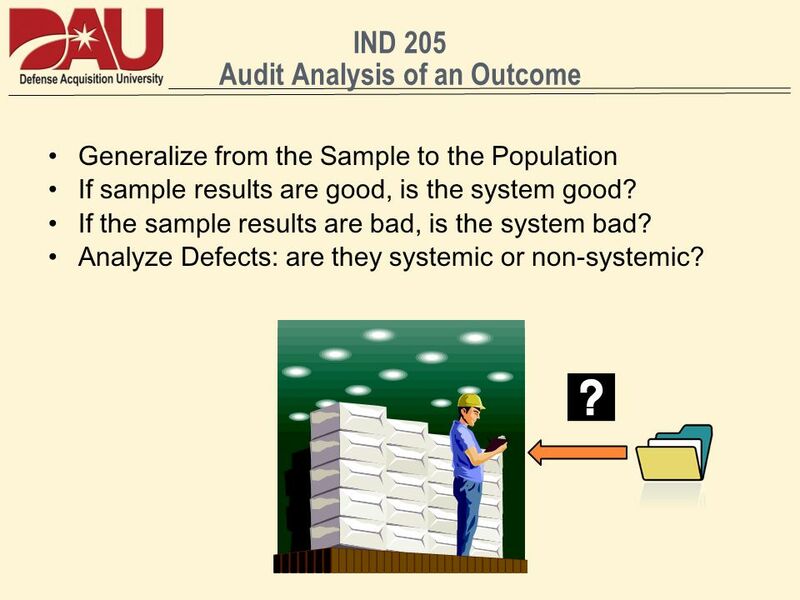 Generalize from the Sample to the Population If sample results are good, is the system good? If the sample results are bad, is the system bad? Analyze Defects: are they systemic or non-systemic? FAR (g) Systems Analysis Should it be determined by the Government that the Contractor's (or subcontractor’s) property management practices are inadequate or not acceptable for the effective management and control of Government property under this contract, or present an undue risk to the Government, the Contractor shall prepare a corrective action plan when requested by the Property Administrator and take all necessary corrective actions as specified by the schedule within the corrective action plan. 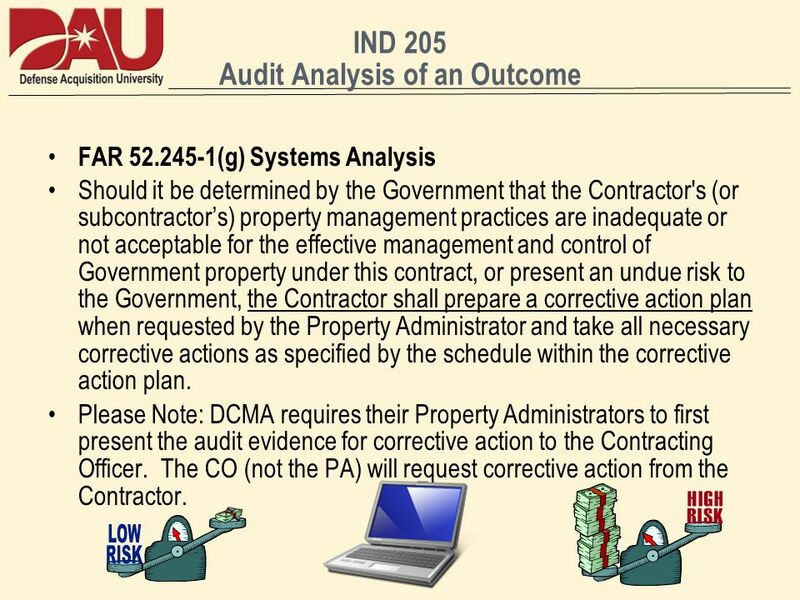 Please Note: DCMA requires their Property Administrators to first present the audit evidence for corrective action to the Contracting Officer. The CO (not the PA) will request corrective action from the Contractor. 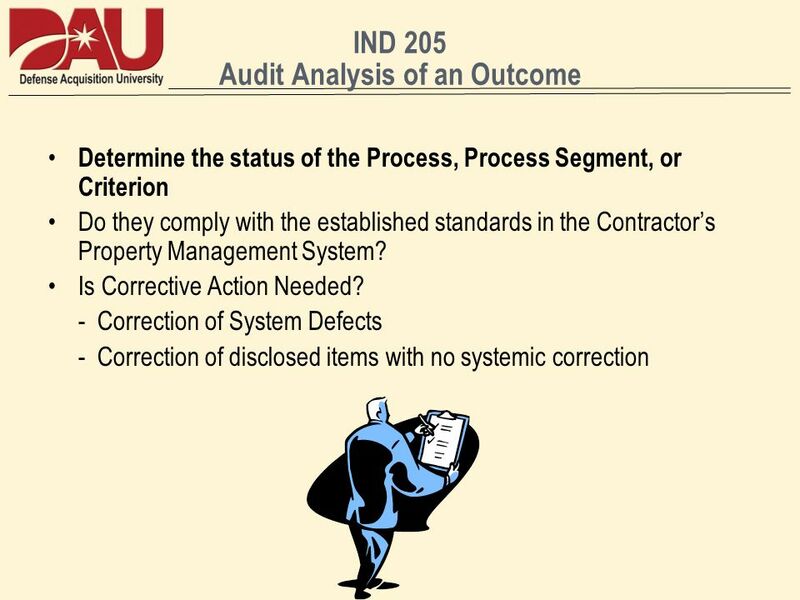 Download ppt "IND 205 Audit Analysis of an Outcome"
IND 205 Auditing a Contractors Property Management System TLO #9 Auditing a Contractors Property Management System. Property Administration (PA) Capital Rehabilitation and Preventative Maintenance of Government Property Revision #, Date (of revision) Presented By: Mr. Effectively Integrating Information Technology (IT) Security into the Acquisition Process Section 4: Effective Integration. Chapter 7: Key Process Areas for Level 2: Repeatable - Arvind Kabir Yateesh. Pertemuan Matakuliah: A0214/Audit Sistem Informasi Tahun: 2007. 18- 1 © 2006 The McGraw-Hill Companies, Inc., All Rights Reserved. Chapter 18 Integrated Audits of Internal Control (For Public Companies Under Sarbanes-Oxley. Prepared by Long Island Quality Associates, Inc. ISO 9001:2000 Documentation Requirements Based on ISO/TC 176/SC 2 March 2001. FPSC Safety, LLC ISO AUDIT. Technical requirements  Sampling  Analysis  Reporting of the results. Auditor's report Document prepared by the auditors appointed to examine and certify the accounting records and financial position of a firm. It must be.